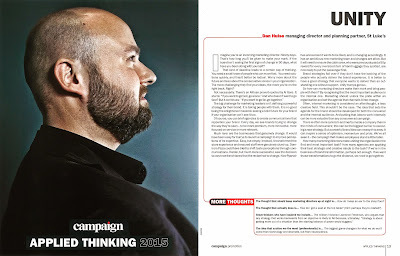 Our MD and Planning Director Dan Hulse, has yet again been busy writing articles for industry press, and has just been published as one of the writers in a series of essays entitled 'Applied Thinking', which feature in Marketing Magazine and Campaign. Dan's piece, entitled 'Unity,' focuses on the desire for Marketing Directors to create change within their corporations, who all too often prioritise the short term changes that can occur during their tenure, rather than striving for strategic long term changes which can fundamentally improve and grow their brands and businesses. Dan explains that through unity with their internal teams, and agencies as key strategic partners, Marketing Directors can really change their businesses and create impactful communications which drive further and deeper than creating ads, but mould the whole business from the inside out. Citing that really the most impactful audience is the internal one, and that unity as a business and with their partner agency on board too, real change can be realised. This reflects the work Dominos and Currys have carried out with their brands, but also the projects we have implemented with our Majestic Wine client at St Luke's, and the projects we continue to strive for as we set Agendas for our clients to allow them to outmanoeuvre their competition.